A horse! A horse! My kingdom for a sleeping horse… #narrowboat #england #winter – The Diesel-Electric Elephant Company. Quo vadis Hutson in 2018? Well, up and down the canal a bit this morning but I can’t yet vouch for the remainder of the coming year. Does it really matter? We’re all going to Hell in a hand-cart anyway. 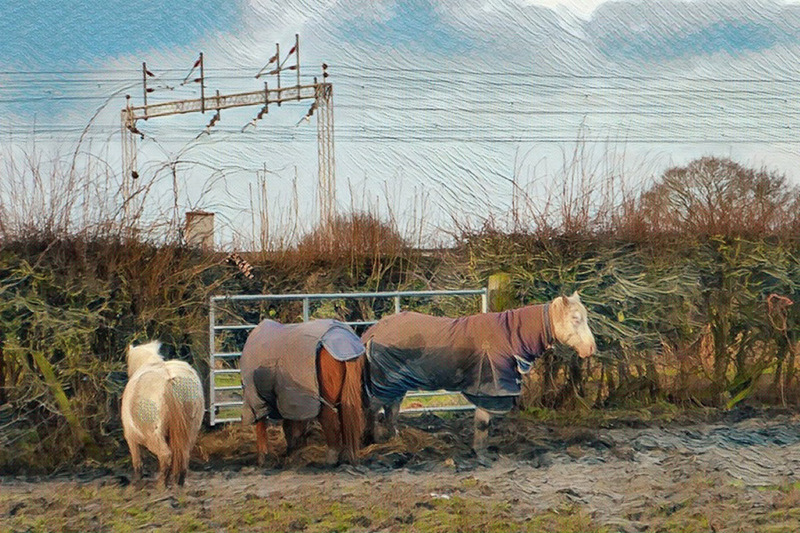 Well, humans are, certainly, but I think that these horses intend to side-step our fate by just sleeping until we’re all gone and the lease on the planet reverts to Father Nature. I doubt that he’ll give humans their deposit back, we won’t exactly be leaving the property in tipetty-top condition, shall we? Horses standing, asleep, in mud. They’re loved and cared for, and are wearing coats the better to fend off the attentions of january in England. In a lot of England’s countryside it’s easy to look, let slip an “ooh gosh” and imagine that the land is untouched by human hand. Not a bit of it, there isn’t a square inch of England that hasn’t seen the effects of the human hand. Sometimes we get it right, more often than not we just give up and let ourselves get used to it, turning the proverbial blind eye. Even if you are standing in the middle of a protected National Park, and England has many such, you got there by road and path, and there’s almost certainly a water reservoir somewhere between you and the horizon. Still, whatever we’ve done to the place, even some of the grotty bits still have a stark beauty. The wavelets on the canal today are parallel corrugations. Nice to boat through, but I wouldn’t want to drive over them. Rolling meadow, deforested, flattened and farmed since King Alfred first looked up the recipe for cheese & onion scones. Some of the beauty along certain stretches of the canals has to be appreciated in a less timeless, more recently-invented “post-apocalyptic” sense of the word “beauty”. You do rather have to stretch a point though to see it. Is it possible stretch a point? Stretched, it would no longer be a point but more of a smudge, surely? Enough navel-gazing, you idiot. Proceed. There are many splendid and varied free hobbies available to a chap living on England’s canals. Watching is one of my favourites. I love watching the nation’s dogs walking past, some energetic and eager, some creaking at the canine-hip, others lost in play with their proudest possessions, a tennis ball or a football ball or some monstrously over-sized stick. I love watching the sky, the clouds, the sun and the changing seasons of the trees. This is probably a lot to do with why I prefer the rural canals, the horizons are more open and the skies that much larger. Lacking only the descent of an archangel, perhaps. I’m not the brightest little chisel in the toolbox, things take a while to sink in. E45 Cream, for one thing, that can take ages to sink in. Seriously, without clouds what would a landscape be? Nought but an ancient canal bridge with a fifty-thousand kilo juggernaut thundering over it. Actually, this lorry announced its arrival long, long before I took this photograph. Either it had something seriously wrong with its exhaust system or else it was on a mission to chase down and eat people. It sounded terrifying. The angle of the lane prevented me from checking that there really was a human driver at the wheel, and it wasn’t some “horror movie” fore-runner of the driverless indecencies that are coming to our roads. In the photograph below you can see the eye-soothing wonders of the current (hah! current!) electrocuted multi-track railway line. It is to be “replaced” by the multi-trillion guinea “HS2” project with “H” and “S” suggesting – with the wry, sardonic humour that only governments and vast corporations can truly muster – “High” and “Speed”. Her Majesty’s “HS2” will whisk you from any of London, Birmingham, Leeds and Manchester to any other within or soon after the blink of a “customer-experience fortnight” provided that there are no leaves on the line, no snowflakes and that someone in HQ remembers to put two shillings in the meter to cover the electrickery cost for the day. I have heard it promised that the chap proceeding in front with the customary red warning flag will be required on occasion to run. No-one has yet adequately explained to me why anyone would want to be in any of London, Birmingham, Leeds or Manchester to begin with, let alone to swap that nightmare for any of the others. Here’s a “high speed” (fnarr-fnarr!) long Virgin Express adding Blethering Branson’s version of glitz and glamour to the countryside. Personally, I’d rather travel by narrowboat. Oh hang on though, I do travel by narrowboat. Average speed when rushing about something on the order of 2¾mph. Heady stuff, eh? I’m slightly faster on the towpath on foot. It’s just my opinion, but I don’t think that you can beat a good mooch around. Whatever the scenery, be it good, bad or demi-apocalyptic, it does so much more than merely blow the overnight cobwebs away. It recharges the human batteries, and on a good day it can put a chap back in touch with the thin, thin veil of atmosphere that we scurry about under, and with the peculiarities – for they are peculiar – of nature. What a lovely oblate spheroid of iron and mud that we cling to, eh? Once we’re gone, a species no longer, a mere layer of plastic and dodgy chemical soup in the fossil record, how long will it take, I wonder, for the human attempt at making trees to vanish? Nothing like as good as the real ones, are they? I am a very, very strange person but I do wish that they had at least strung four cables along these skeletal monsters, two on each side. At least then my O.C.D. wouldn’t scream about the imbalance. It’s doing it now, my O.C.D. is hanging out of my left ear, gesticulating rudely and shouting about “lopsided” and “ungainly”. I’d better take it indoors and let it calm down again. It will calm down indoors today because I have a stash of fresh veggies that I have already enboilinated and steamed, all ready for a ‘xtremely unhealthy veggy hash, cooked in total contempt of E.U. rules to a dark, dark brown crust (the E.U. is currently demanding that we all cook our food to no more than a “light golden yellow”). Oh damn it, there are other parts of my psyche now just queuing up to hang out of my ears and scream obscenities at E.U. officials and anyone who will listen. I don’t want to wake those horses up. Time for lunch, some proper work and then maybe a snooze myself. The people in the world who don’t think the way that we and others of our ilk do. The idea of devastating this kind of countryside and the peace of nature with more potential rail disasters is a travesty. It’s only when you get off the rat race merry-go-round do you realise the shere stupidy of it and wonder what you did all those years at such a speed to further progress the human race. Progress one day I am sure will involve planting trees and hoping they will grow in a barren landscape……we need pictures to remind us what we once had. No-one’s chasing happiness anymore, everyone’s chasing money – and at that not even real money, just the made-up stuff that the banks and industry and government peddle these days. Expand expand expand! Grow grow grow! More more more! Why not simply “better better better” – and by better I mean better for people, animals, the planet and the future? Tis madness. I imagine that High Speed Train is there to encourage people who commute to work in an entirely different city. I work at a black car company that takes 30 people or more every week to the airport on Monday and then picks them up on Friday. Commuting to work in a different city. I cannot imagine deliberately living that lifestyle. Especially since these people have LOTS of money. But they deliberately inflict that horrible commute on themselves as though they have NO CHOICE. So I imagine all that money was spent for a few rich people who refuse to move their family to where their job is.